In general, code should always use the macros above (or functions in map.c) to access many of the values in the map structure. Failure to do this will almost certainly break various features. You may think it is safe to look at width and height values directly (or even through the macros), but doing so will completely break map tiling. Definition at line 325 of file map.h. Background music to use for this map. Definition at line 367 of file map.h. Referenced by free_map(), load_map_header(), pick_bg_music(), and save_map(). Linked list of linked lists of buttons. Definition at line 354 of file map.h. Referenced by add_button_link(), find_unused_connected_value(), free_map(), get_button_links(), get_button_value(), Map_TriggerConnected(), remove_button_link(), runtrigger(), update_buttons(), and verify_button_links(). Indicates level of darkness of map. Definition at line 346 of file map.h. Referenced by adj_attackroll(), cfapi_map_get_map_property(), change_map_light(), dump_map(), hideability(), load_map_header(), monster_can_detect_enemy(), monster_can_see_enemy(), monster_check_wakeup(), monster_move(), read_map_log(), save_map(), set_darkness_map(), and write_map_log(). What level the player should be to play here. Definition at line 343 of file map.h. Referenced by apply_auto(), apply_auto_fix(), attempt_hide(), attempt_pick_lock(), calc_skill_exp(), command_create(), command_goto(), current_map_info(), do_auto_apply(), do_hidden_move(), dump_map(), fix_generated_item(), generate_monster_arch(), generate_monster_inv(), generate_random_map(), load_map_header(), map_info(), place_chest(), polymorph_living(), CREMapInformationManager::process(), process_map(), put_a_monster(), read_map_log(), rune_attack(), save_map(), START_TEST(), trap_disarm(), trap_see(), and write_map_log(). Definition at line 348 of file map.h. Referenced by cfapi_map_get_map_property(), cfapi_object_transfer(), load_map_header(), and save_map(). Enter_x and enter_y are default entrance coordinates to use for a map such that when an exit specifies hp,sp of -1,-1 for an exit pointing to the map, when the exit is applied, the character is placed at enter_x,enter_y when they arrive. If true, reset time is not affected by players entering/exiting map. Definition at line 335 of file map.h. Referenced by load_map_header(), save_map(), and swap_map(). Width and height of map. Definition at line 347 of file map.h. Referenced by cfapi_map_get_map_property(), get_empty_map(), load_map_header(), load_objects(), map_size(), monster_compute_path(), save_map(), and START_TEST(). Definition at line 345 of file map.h. Referenced by allocate_map(), check_active_maps(), clean_tmp_files(), command_reset(), delete_map(), draw_client_map(), dump_map(), ensure_map_in_memory(), esrv_draw_look(), flush_old_maps(), free_all_maps(), free_all_objects(), free_map(), get_empty_map(), get_linked_map(), get_map_from_coord(), leave(), load_overlay_map(), load_temporary_map(), load_unique_objects(), malloc_info(), map_info(), map_least_timeout(), mapfile_load(), monsterFight(), move_player(), object_free2(), object_remove(), object_update(), out_of_map(), pets_follow_owner(), CREMapInformationManager::process(), process_events(), process_map(), read_map_log(), ready_map_name(), save_map(), swap_map(), and write_map_log(). If set, this is a template map. Definition at line 338 of file map.h. Referenced by enter_fixed_template_map(), enter_random_template_map(), flush_old_maps(), load_map_header(), and save_map(). A timestamp of the last original map loading. Definition at line 366 of file map.h. Referenced by cast_create_town_portal(), generate_random_map(), get_linked_map(), load_map_header(), ready_map_name(), and save_map(). Definition at line 362 of file map.h. 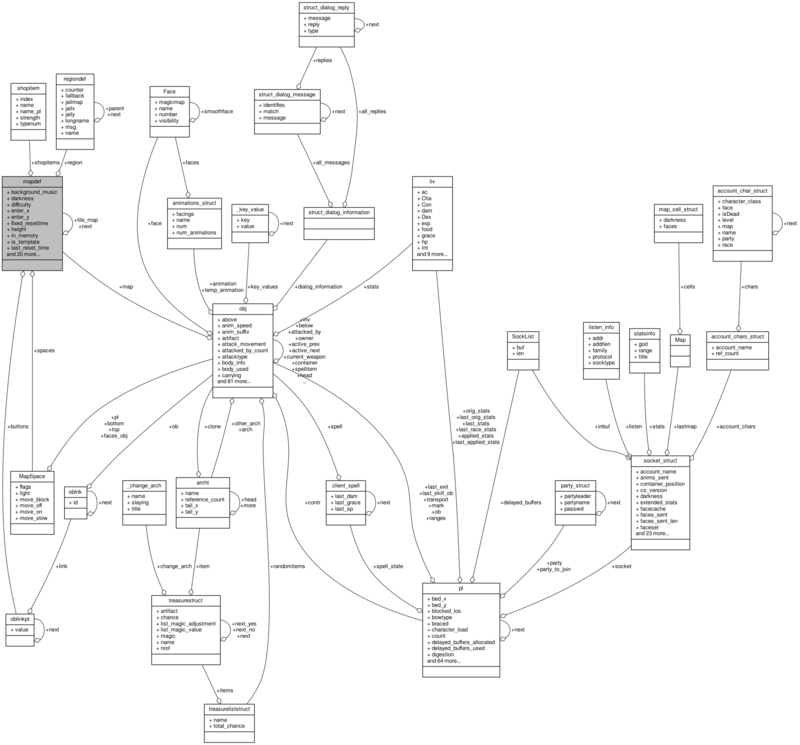 Referenced by dump_map(), free_map(), load_map_header(), process_map(), and save_map(). Message map creator may have left. Definition at line 361 of file map.h. Referenced by cfapi_map_get_map_property(), current_map_info(), dump_map(), free_map(), generate_random_map(), load_map_header(), and save_map(). Name of map as given by its creator. Definition at line 328 of file map.h. Referenced by account_char_add(), cfapi_map_get_map_property(), current_map_info(), deathstrike_living(), do_execute_event(), enter_fixed_template_map(), enter_random_template_map(), free_map(), get_name_of_region_for_map(), get_who_escape_code_value(), hiscore_check(), load_map_header(), map_get_path(), parse_shop_string(), CREMapInformationManager::process(), process_map(), and save_map(). Definition at line 326 of file map.h. Referenced by cfapi_map_get_map_property(), check_active_maps(), clean_tmp_files(), command_style_map_info(), dawn_to_dusk(), delete_map(), dump_all_maps(), flush_old_maps(), free_style_maps(), get_linked_map(), has_been_loaded(), key_confirm_quit(), load_style_map(), malloc_info(), map_info(), map_least_timeout(), swap_map(), and write_map_log(). If set the content of this map has smoothlevel=0 forced. Definition at line 339 of file map.h. Referenced by load_map_header(), and save_map(). True if an outdoor map. Definition at line 340 of file map.h. Referenced by dawn_to_dusk(), expand_lighted_sight(), load_map_header(), ready_map_name(), save_map(), and set_darkness_map(). Definition at line 365 of file map.h. Referenced by add_npcs_to_map(), add_object_to_socklist(), allocate_map(), apply_builder_remove(), apply_map_builder(), apply_savebed(), cast_create_town_portal(), cfapi_map_get_map_property(), cfapi_map_set_map_property(), check_altar_sacrifice(), command_overlay_reset(), command_reset(), command_summon(), command_teleport(), convert_item(), create_player_cmd(), current_map_info(), delete_map(), do_exit_map(), dump_map(), ensure_map_in_memory(), enter_exit(), enter_fixed_template_map(), enter_map(), enter_player_savebed(), enter_random_map(), enter_random_template_map(), enter_unique_map(), examine(), expand_lighted_sight(), find_or_create_connection_for_map(), flush_old_maps(), generate_random_map(), get_exit_seed(), get_map_id(), get_map_zone(), get_who_escape_code_value(), get_zone_for_map(), has_been_loaded(), hiscore_check(), is_legal_2ways_exit(), key_confirm_quit(), load_and_link_tiled_map(), load_map_header(), load_objects(), load_overlay_map(), load_style_map(), load_temporary_map(), load_unique_objects(), map_get_path(), map_info(), map_least_timeout(), map_remove_unique_files(), mapfile_load(), monster_find_nearest_living_creature(), move_creator(), move_detector(), move_duplicator(), move_firewall(), move_player_mover(), object_remove(), place_exits(), CREMapInformationManager::process(), process_events(), process_map(), put_doors(), read_map_log(), save_map(), save_player(), shop_specialisation_ratio(), START_TEST(), swap_below_max(), swap_map(), teardown(), update_position(), and write_map_log(). How many players are on this level right now. Automatically updated by the object handling functions. Definition at line 344 of file map.h. Referenced by cfapi_map_get_map_property(), command_kick2(), command_nowiz(), current_map_info(), do_wizard_hide(), enter_map(), map_info(), object_insert_in_map(), and object_remove(). What jurisdiction in the game world this map is ruled by points to the struct containing all the properties of the region. Definition at line 329 of file map.h. Referenced by generate_random_map(), get_map_id(), get_name_of_region_for_map(), load_map_header(), CREMapInformationManager::process(), and save_map(). When this map should reset. Definition at line 332 of file map.h. Referenced by cfapi_map_get_map_property(), command_reset(), monsterFight(), CREMapInformationManager::process(), process_map(), read_map_log(), START_TEST(), swap_map(), and write_map_log(). How many seconds must elapse before this map should be reset. Definition at line 333 of file map.h. Referenced by cfapi_map_get_map_property(), load_map_header(), and save_map(). How much our shopkeeper overcharges. Definition at line 358 of file map.h. Referenced by include_map_in_map(), load_map_header(), CREMapInformationManager::process(), save_map(), shop_describe(), and shop_greed(). List of item-types the map's shop will trade in. Definition at line 356 of file map.h. Referenced by free_map(), include_map_in_map(), load_map_header(), print_shop_string(), CREMapInformationManager::process(), save_map(), shop_describe(), and shop_specialisation_ratio(). MMaximum price a shop will offer. Definition at line 360 of file map.h. Referenced by include_map_in_map(), load_map_header(), CREMapInformationManager::process(), save_map(), shop_describe(), and value_limit(). Minimum price a shop will trade for. Definition at line 359 of file map.h. The preffered race of the local shopkeeper. Definition at line 357 of file map.h. Referenced by free_map(), include_map_in_map(), load_map_header(), CREMapInformationManager::process(), save_map(), shop_approval(), and shop_describe(). Array of spaces on this map. Definition at line 355 of file map.h. Referenced by allocate_map(), blocked_link(), free_map(), and get_map_flags(). When it reaches 0, the map will be swapped out. Definition at line 342 of file map.h. Definition at line 364 of file map.h. Referenced by adjacent_map(), delete_map(), free_map(), get_map_from_coord(), load_and_link_tiled_map(), out_of_map(), and update_all_los(). Definition at line 363 of file map.h. Referenced by free_map(), get_map_from_coord(), load_and_link_tiled_map(), load_map_header(), out_of_map(), CREMapInformationManager::process(), process_map(), and save_map(). Swapout is set to this. Definition at line 341 of file map.h. Referenced by check_active_maps(), command_kick2(), draw_client_map(), enter_map(), flush_old_maps(), leave(), load_map_header(), map_info(), map_least_timeout(), read_map_log(), set_map_timeout(), and swap_below_max(). Definition at line 327 of file map.h. Referenced by cfapi_map_get_map_property(), clean_tmp_map(), delete_map(), dump_map(), flush_old_maps(), load_temporary_map(), load_unique_objects(), read_map_log(), ready_map_name(), save_map(), and write_map_log(). If set, this is a per player unique map. Definition at line 337 of file map.h. Referenced by cfapi_map_get_map_property(), command_reset(), decay_objects(), enter_unique_map(), flush_old_maps(), load_map_header(), map_remove_unique_files(), and save_map(). Referenced by blocked_link(), cfapi_map_get_map_property(), get_empty_map(), get_map_flags(), load_map_header(), load_objects(), map_size(), monster_compute_path(), save_map(), and START_TEST().